Lando Calrissian is a charmer. He’s the smooth-talking smuggler of Cloud City and long-time ally to Han Solo, and in 2018, he’ll be played by the equally-cool Donald Glover, the actor, writer, producer and musician who has risen through the ranks to become one of the hottest stars of the moment. It is, in the words of Glover, the role of a lifetime, and the former Community star has acknowledged the pressures of tackling such an iconic character in the past. Starring opposite Alden Ehrenreich’s infamous nerf-herder, we’ve yet to catch a glimpse of Glover in costume – leaked set photos have unveiled key locations from Phil Lord and Chris Miller’s anthology film, among other juicy tidbits – but as filming continues, it’s only a matter of time before the first photos of the young Lando Calrissian surface online. For now, Deadline has produced the next best thing: an in-depth interview with Glover about his long-time affinity for Star Wars, and what it’s like to walk in the footsteps of Billy Dee Williams. This is probably one of my favorite experiences ever. For working under, like, a huge conglomerate, it’s actually been quite an enjoyable, artistic thing. I get to play him in a way that I think is honest and true and cool. And it’s great ’cause I didn’t have to write anything, I’m focused strictly on being this guy. And I really respect him and I respect the actor who played him before. I’ve learned a lot about this character, so it’s actually been really fulfilling and nice to just turn off everything else and focus on just being someone. So it’s been cool. But perhaps the one element of Lando’s character that truly piqued Donald Glover’s curiosity is the fact that, for such a fan-favorite, there was always an air of moral ambiguity lingering over Cloud City’s most iconic smuggler. 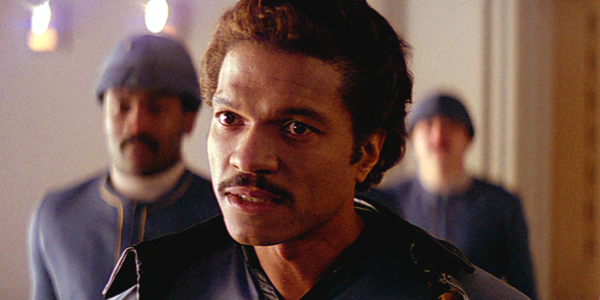 Lando seems to be a lot of people’s favorite character. It’s cool. It’s a lot of pressure, but it’s also very exciting. He was my favorite character too. I grew up on Star Wars. It’s just cool to see him again. I feel like people like him ’cause he has a lot of style, but also he’s a complicated character in this world. I think even Han isn’t as complicated as Lando is. From the first time you meet him, you don’t know whether to trust him or not, and you’re constantly not knowing whether to trust him. I like that about him. The Han Solo anthology movie will see a release on May 25th, 2018. Long before that, Donald Glover fans can look forward to the actor/musician cropping up in Spider-Man: Homecoming, while a second season of Atlanta is also on the cards.